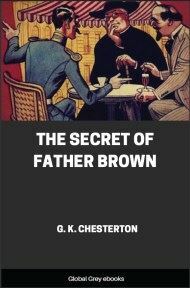 Third book of the Father Brown series. Eight short stories including: The Resurrection of Father Brown; The Arrow of Heaven; The Oracle of the Dog; The Miracle of Moon Crescent; The Curse of the Golden Cross; The Dagger with Wings; The Doom of the Darnaways; and, The Ghost of Gideon Wise. Strangely enough, this wandering limelight struck him in the most obscure, or at least the most remote, of his many places of residence. He had been sent out to officiate, as something between a missionary and a parish priest, in one of those sections of the northern coast of South America, where strips of country still cling insecurely to European powers, or are continually threatening to become independent republics, under the gigantic shadow of President Monroe. The population was red and brown with pink spots; that is, it was Spanish-American, and largely Spanish-American-Indian, but there was a considerable and increasing infiltration of Americans of the northern sort — Englishmen, Germans, and the rest. And the trouble seems to have begun when one of these visitors, very recently landed and very much annoyed at having lost one of his bags, approached the first building of which he came in sight — which happened to be the mission-house and chapel attached to it, in front of which ran a long veranda and a long row of stakes, up which were trained the black twisted vines, their square leaves red with autumn. Behind them, also in a row, a number of human beings sat almost as rigid as the stakes, and coloured in some fashion like the vines. For while their broad-brimmed hats were as black as their unblinking eyes, the complexions of many of them might have been made out of the dark red timber of those transatlantic forests. Many of them were smoking very long, thin black cigars; and in all that group the smoke was almost the only moving thing. The visitor would probably have described them as natives, though some of them were very proud of Spanish blood. But he was not one to draw any fine distinction between Spaniards and Red Indians, being rather disposed to dismiss people from the scene when once he had convicted them of being native to it. 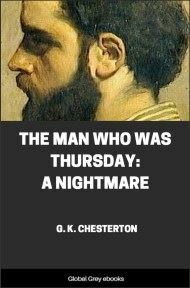 He was a newspaper man from Kansas City, a lean, light-haired man with what Meredith called an adventurous nose; one could almost fancy it found its way by feeling its way and moved like the proboscis of an ant-eater. His name was Snaith, and his parents, after some obscure meditation, had called him Saul, a fact which he had the good feeling to conceal as far as possible. Indeed, he had ultimately compromised by calling himself Paul, though by no means for the same reason that had affected the Apostle of the Gentiles. 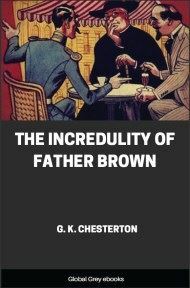 On the contrary, so far as he had any views on such things, the name of the persecutor would have been more appropriate; for he regarded organized religion with the conventional contempt which can be learnt more easily from Ingersoll than from Voltaire. And this was, as it happened, the not very important side of his character which he turned towards the mission-station and the groups in front of the veranda. 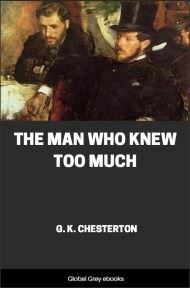 Something in their shameless repose and indifference inflamed his own fury of efficiency; and, as he could get no particular answer to his first questions, he began to do all the talking himself. Mr Paul Snaith came inside; and it was the beginning of a considerable increase of that journalist’s information on many things. Presumably his journalistic instinct was stronger than his prejudices, as, indeed, it often is in clever journalists; and he asked a good many questions, the answers to which interested and surprised him. He discovered that the Indians could read and write, for the simple reason that the priest had taught them; but that they did not read or write any more than they could help, from a natural preference for more direct communications. He learned that these strange people, who sat about in heaps on the veranda without stirring a hair, could work quite hard on their own patches of land; especially those of them who were more than half Spanish; and he learned with still more astonishment that they all had patches of land that were really their own. That much was part of a stubborn tradition that seemed quite native to natives. But in that also the priest had played a certain part, and by doing so had taken perhaps what was his first and last part in politics, if it was only local politics.